Rajma is a very popular dish in Northern India. Red Kidney Beans in a thick gravy with lots of Indian Spices is usually served with Rice, Jeera Rice or Chapati or Naan. Soak the red kidney bean overnight or soak it in hot water for 2 to 3 hours. Pressure cook the Rajma with a pinch of asafoetida for 4 to 5 whistles. Heat oil in a pan and add the bay leaf, cinnamon stick and cloves. Then add the cumin seeds followed by the chopped onions. Add some salt and fry till they become translucent. Add the chopped green chillies and grated ginger and fry for 2 minutes. Now add the chopped tomatoes and tomato paste and fry. Cover and cook it in medium flame for 10 minutes. Then add the red chilli powder, coriander powder, cumin powder and garam masala and fry for another 3 minutes. Add little water if needed. Cook till the tomatoes are completely mashed. Now add the boiled kidney beans along with the water and let it boil for 10 minutes. Add the butter and heavy cream and mix well. If there is excess water which is used to boil the Rajma, we can use that water for the curry. We can adjust the water quantity according to our required consistency. I like the Curry to be little thick. Adding butter and heavy cream is totally optional. We can grind 3 tbsp of cooked Rajma and add to the curry if we want the gravy to be more thick which is again totally optional. We just made a huge pot of rajma and I am in LOVE with it!! 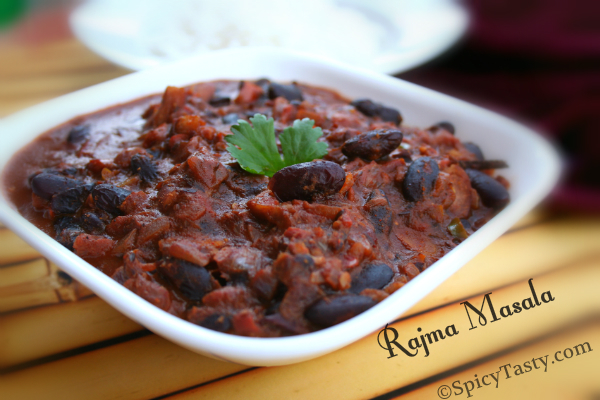 love love love rajma masala…looks so divine. 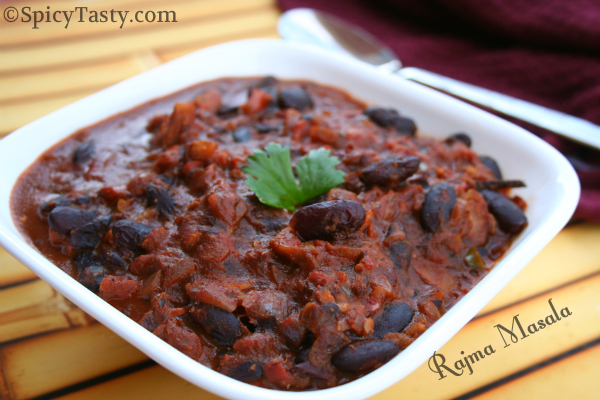 Very inviting and delicious looking rajma curry.